Congratulations to the First Communion Class of 2009. First Communion Mass will be celebrated at 10 AM Sunday, May 3, 2009. 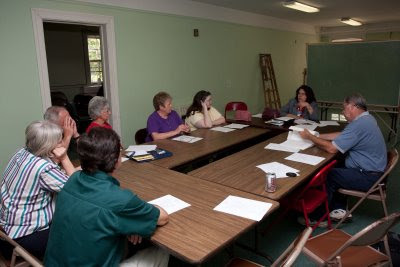 The bulletin for the weekend of May 03, 2009 has been posted. Click here to see it. The new calendar on the website has been updated with all events for the coming week along with prayer intention information for all of the masses. Take some time to look at our new calendar here. Updates are also being made to our new St. Landry Catholic Church blog. You can get to the blog from the church home page under the Bulletins and News section or you can just click here to go to it. "That the laity and the Christian communities may be responsible promoters of priestly and religious vocations". "That the recently founded Catholic Churches, grateful to the Lord for the gift of faith, may be ready to share in the universal mission of the Church, offering their availability to preach the Gospel throughout the world". 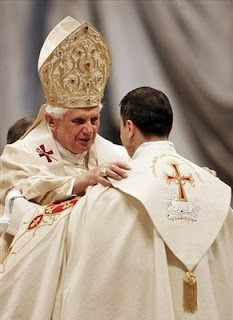 These intentions fit well with the upcoming "Year for Priests" that will begin on 19 June and last until 19 June 2010. In fact, it is the 150th anniversary of the death of the Holy Curé d'Ars, John Mary Vianney, a true example of a pastor at the service of Christ's flock. During this year, the St. Landry Catholic Church community hopes to emphasize vocations and the importance of the priesthood. This coincidently falls in the 100th year anniversary of the celebration of the first mass within the current church building. St. Landry Church Parish has a long history that dates back to 1776. The cemetery on the grounds of the church dates back to that very beginning. Over the years, the weather and elements have not been kind to the tombs of parishioners that have come before us. And that's where the Cemetery Tours come in. Each year, on the two middle weekends of October, parishioners, the Opelousas Little Theatre, and other members of the community come together to portray people associated with the families buried in our cemetery. From governors and judges, bakers and soldiers, priests and slaves, house wives and festival queens, the people portrayed cover every nationality, race, and social status found in our parish. All of the proceeds from our tour are used in restoring tombs of the departed that no longer have families to care for them. 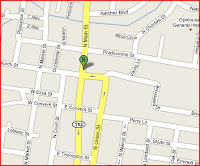 The New Life Center is located at 411 East Landry Street, Opelousas, Louisiana. 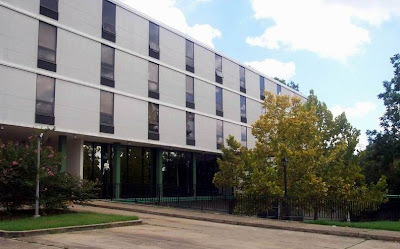 The project just completed encompasses the renovation of the fourth floor of the New Life Center, expanding the facility capacity by 20 additional motel style rooms with private bathrooms, to provide transitional housing for homeless women and children. Four of these newly renovated rooms will be used to house homeless female veterans. Additionally, the project included the renovation of space on the first floor to create four new staff offices. Specific details of the project include the installation of a sprinkler system; individual room A/C and heating units; electrical wiring; vinyl flooring; fire alarm system; bathroom ventilation refurbishing the exterior fire escape and exterior doors; replacement of ceilings; repair and repainting of all walls and doors; installation of two large dehumidifiers to remove moisture from the facility; and the creation of two handicap bathrooms. Bishop Michael Jarrell of the Diocese of Lafayette, Louisiana was in Opelousas today for the dedication of the newly renovated 4th floor of the New Life Center. The New Life Center, located in Opelousas provides emergency shelter, transitional housing and supportive services for up to 37 homeless women and 31 children per night. All residents participate in case management where they are assisted with applying for mainstream benefits, entering school, obtaining employment and permanent housing. 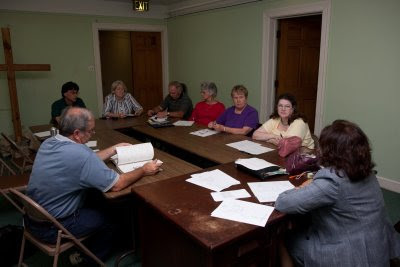 Residents also attend life skills sessions, jobcounseling and are referred to outside agencies for additional counseling. A chemical dependency program is also available for those women recovering from alcohol and/or drug addictions. All residents are provided with three meals a day, transportation, prescription assistance, clothing, diapers and toiletries. From Yvonne Normand: "It brought tears to my eyes as I was there about 17 years ago when we started tearing down walls on the 1st and 2nd floor." This Friday, May 1, 2009, is the First Friday of the month. First Friday devotions date back to the 17th century within the Church. receive Communion on the First Friday of nine consecutive months the grace of final repentance; they shall not die under my displeasure, nor without receiving their Sacraments; My heart shall be their assured refuge at that last hour. 478 Jesus knew and loved us each and all during his life, his agony and his Passion, and gave himself up for each one of us: "The Son of God. . . loved me and gave himself for me." He has loved us all with a human heart. For this reason, the Sacred Heart of Jesus, pierced by our sins and for our salvation,"is quite rightly considered the chief sign and symbol of that. . . love with which the divine Redeemer continually loves the eternal Father and all human beings" without exception. First Friday adoration begins at 7 AM in the chapel at Valentin Hall. It will continue until First Saturday mass at 8 AM Saturday morning. 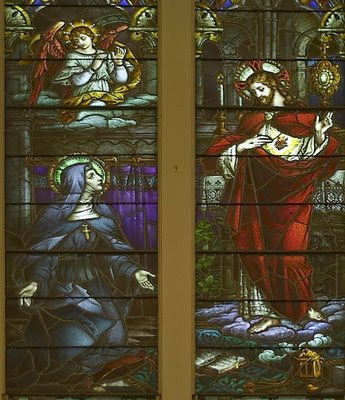 To read more about St. Margaret Mary, click here. To read more about meditations, a novena, and an offering to the Sacred Heart, click here. The 23rd annual Festival International de Louisiane is a wonderful free festival in Lafayette. One of the highlights of the event is a mass en Francaise ... a mass celebrated in French. Father Bill Melancon from St. Peter's Catholic Church in Carencro was the celebrant. Read more about it here. J’ai beaucoup amié la messe. 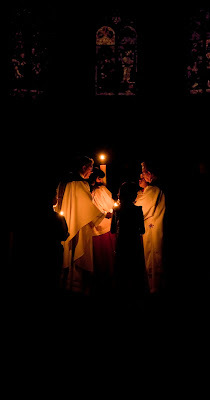 We really had a beautiful Easter Vigil mass at St. Landry Catholic Church. Monsignor Robert Romero and Deacon John Miller can be seen here with the Easter candle and altar servers. The Contact Information page for the website has been totally updated. New links to our blog and twitter feed have been added. A link to send a message back to the parish office has been added. Even a Google Map directing you to the church is there. Take a look and drop us a message by clicking here. In the 100th anniversary year of the building of our current church building, St. Landry Catholic Church is now on Twitter. Our account name there is StLandryCath. Follow us here. Dr. Richard Harmon’s book, “St. 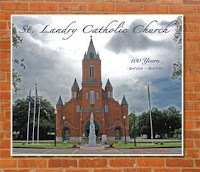 Landry Catholic Church - 100 years” is now available. 106 pages of beautiful photographs of our 100 year old church building along with information and history of the church is contained within. The price is $42 and it is available at the Catholic Booke Store, 2365 Larkspur Lane, Opelousas, LA as well as Andrepont Printing, 5043 I-49 South Service Road, Opelousas, LA. Dr. Harmon's website has sample photos of the church that you can see by clicking here. The bulletin for the weekend of April 26, 2009 has been posted. Click here to see it. A study was run some time back that showed the number of people entering religious life in different dioceses across the nation. The one pattern that was found was that those dioceses that consistently had activity on the internet had a higher number of vocations. I think we have to make an effort here on the parish level. All of these new changes to the website and blog are part of that. You can now email the parish office directly from the website. Going to the website and clicking "Contact Info" will bring you to a page where all of the contact information for the church appears ... that's the address, phone numbers, and email address. A link there says, "Or click here to send an email message to the parish office." Clicking that link brings you to this page. This will make it easier for folks to contact our parish. The Photosynth of the Lt. Father Verbis Lafleur Monument has been updated. The controls that you click to look around the monument have been improved. Over to the right side are highlight photos. These allow you to quickly jump to certain features of the monument such as seeing it from all 4 directions or going direct to the reliefs sculpted into the base. Take a look by clicking here. I think you'll enjoy the new features. More updates are happening at the website. This week, I've added an Event Calendar. This calendar will include the schedule for confessions, events happening around the parish, and the schedule of masses. You can click on each event to find out additional details. For the masses, you can even see the list of intentions --- which will be updated weekly. The calendar is a Google calendar so, if you maintain your own calendar on Google, it's easy to add events from the church calendar to your own calendar. I've also begun adding the liturgical calendar to it. That way, you can look up a day and find out if it is the Tuesday of the 3rd Week of Easter or if it is the Feast of Justin, Martyr. 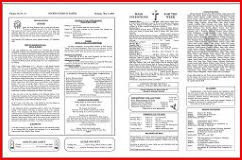 The liturgical calendar is updated currently through May. I hope to have the entire year updated by the end of the week. Take a look at the calendar by clicking here. The website has finally received an overdue facelift. New functionality will follow in a few days. See here: the new look. There is a beautiful monument erected in front of the church in remembrance of Lieutenant Father Verbis Lafleur. 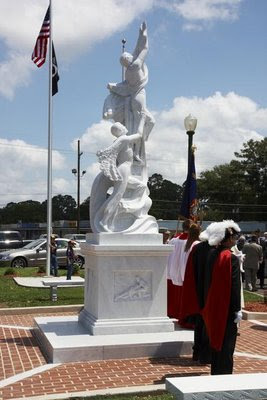 A description of the monument is here. A photo gallery of the church and monument is here. 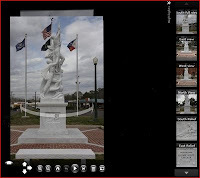 And a new Photosynth of the monument ... a 3 dimensional viewing ... is available here. Masses on Easter Sunday - April 12, 8 AM and 10 AM.